THE FOOD POET (TFP): How did the grain of the idea for this book come about? What is it from a poem Stephen read, dish Myra cooked or a comment made in conversation? 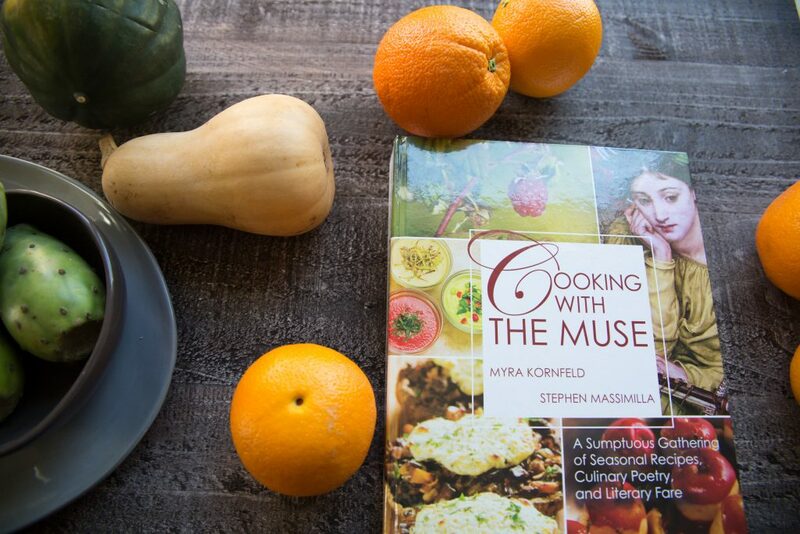 MYRA KORNFELD/STEPHEN MASSIMILLA: So you’re asking about the Muse for Cooking with the Muse? Well, Myra was always a culinary magician conjuring up new dishes and writing and revising new recipes and articles about food, while Stephen was always the literary wizard conjuring up new poems and writing essays and reviews about poetry and literature. We realized we had perfectly complementary skill sets and that we just had to team up. As the great Roger Vergé put it, the chef works “creatively, marrying ingredients the way a poet marries words”—so cooking is like writing poetry, and it takes a poet to cook up colorful and exciting ways to write about food. We also realized that recipes were a lot like poems. We got to thinking that we could write a truly collaborative book together, one all about the marriage of recipes and poetry, of cooking and writing, and the synergy between the two. TFP: I’d love to know how you two came together to work on this book. MK/SM: One day, while we were sitting at Alice’s Teacup sipping mugs of chai, we came up with the idea of writing a recipe and a poem that would go together perfectly. And we remembered having shared a great cup of dirty chai after having hiked together through Ebenezer Bryce Canyon in Utah. Later, Myra’s Dirty Chai recipe and Stephen’s poem by the title “My Dirty Chai” ended up in the “Chocolate and Coffee” section at the end of the Winter chapter. Things proceeded from there. For instance, the idea for one of the early literary essays in the book—on Galway Kinnell’s sonnet “Blackberry Eating”—came up during another teatime discussion at the start of autumn, when the blackberry muse is at the height of her powers. We made a connection between the Kinnell piece and Mary Oliver’s poem about blackberry picking entitled “August,” which ends with the line “this happy tongue.” We were interested in the polyvalence of the word “tongue”—a term both for language and for the site of gustatory delectation. Kinnell speaks of how words, like blackberries at the peak of their ripeness, “fall almost unbidden to my tongue.” The word “almost” suggests that obtaining the ripest berries does call for some anticipation, but the work of the season can’t be forced. What a great way to think about inspiration! The blackberry recipes at the opening of the book were the upshot. TFP: Stephen, You’ve got so many interesting linguistic facts and poems placed throughout the book. What did the research look like for this book? MK/SM: As a poet and scholar of comparative literature interested in celebrating the cross-fertilization of cultures, Stephen already knew a huge number of culinary poems, but we were startled at just how many we kept encountering. The book includes not only a large number of Stephen’s own poems, but also an unusually wide-ranging anthology of classic and contemporary pieces, including interesting food lore. We collected these materials in folders, which we went through periodically to cull our favorites. We met regularly to pick out the poems that either inspired the recipes or complemented them. We agreed that we both had to be excited about every poem, even Stephen’s original poems. That said, a lot of other research was involved in the writing of the comprehensive introduction to the book, the essays about culinary poems and traditions, and all the historical notes that contextualize both the poetry and the dishes. The bibliography alone was a formidable project. TFP: How did you two collaborate on the recipes and poems? Did you typically start with a poem that inspired the recipe? MK/SM: We were continually writing and collecting poems and recipes and looking at them to see how they could fit together. Sometimes poems inspired recipes; sometimes recipes inspired poems; and oftentimes the juxtaposition of poems and recipes inspired other musings. A lot of the work involved adapting recipes Myra was working on to dovetail with poems that Stephen was writing, or that we knew we wanted to use. As we worked on the outlines for the book over the years, we also realized that certain pieces fit together in sequences that brought out new relationships between the recipes, the poems, the essays, and the photos. All the pieces interlocked like multicolored jigsaw puzzle pieces to make a whole that’s even greater than the sum of the parts. TFP: Myra, this isn’t your first rodeo, but the depth and quantity of recipes in Muse is staggering. What did your recipe development process look like and how long did it take to complete the manuscript from a recipe perspective only? MK/SM: Myra was and is always developing new recipes. She cooks seasonally, inspired by the Greenmarket Muse, and her flavor combinations are often inspired by traveling. The recipes in the Turkish, Irish, American Southwestern, and Moroccan sections of the book, for instance, were to a degree inspired by travels, and Stephen took a number of the food pictures in the book on these trips. Given Myra’s background in nutrition and Real Foods traditions, these dishes highlight fresh, local ingredients and encourage the use of seasonal produce, wild seafood, traditional fats, and meat from pasture-raised animals. Like revising and re-editing poems, recipe writing is an exacting process full of trial and error, but it was great to have had so many scrumptious meals during the planning, writing, photographing, and overall construction of this book. The recipes were also tested on SO many people through our cooking events and classes. We wanted to make absolutely sure that these recipes would be clear and easy to follow for cooks of any and all levels. TFP: Stephen, there are quite a few original pieces of food poetry in Muse. Where did you find your inspiration to write them on deadline? MK/SM: While we were working on Cooking with the Muse, Stephen sometimes composed a poem by the stove while Myra was developing a dish. That happened, to give a couple of examples, with “Seared Tuna with Purple Potatoes and Cherry Tomato Sauce” and with the Salad of a Thousand Leaves recipe; in these instances, the recipe changed to match the poem that was based on it. In this sense, writing poems involved riffing on and helping to reinvent recipes. Though it began with a lot of intuitive hunting and gathering and freewheeling improvisation, the book also contains a great many prose introductions, recipe preambles, essays, and carefully researched historical and literary notes, all of which had to be planned, composed and revised in a more systematic way. We were both so inspired because cooking and poetry have so much in common. They are both creative and celebratory arts. They’re both about traditions of nourishment in the very deepest sense. They both reflect our values and feelings. And they’re both inseparable from human relationships, as well as our relationship to the earth, the seasons, and the spirit within us. TFP: What does your poetry writing process look like? MK/SM: Stephen always carries a little black notebook full of notes and sketches (he’s also a drawer and painter) about what the Muse happens to be saying—which could take any number of forms. His favorite pieces often reflect more than one source of inspiration, including the time of year; an intriguing word or phrase; a memorable dream; or even another work of art—a painting, a film, a novel, or, as he’s mentioned, a dish. He composes most of his poems themselves at night, when the house is quiet and the world is calm, when the air freshens and flows around the writer without interruption. And speaking of the atmosphere, the greenmarket (a living celebration of the seasons and the lush creations born of human collaborations with nature) was a major source of inspiration for Cooking with the Muse. Not only most of the poems and recipes, but also the poetic-prose essays introducing each chapter could be said to be odes to the farmers’ market. TFP: Is there one recipe that stands out among the rest that, if you dog-eared pages of the book, would be the one to which you continue to return? MK/SM: There are many, actually. In the book itself, we mention which ones we consider staples to be making all the time. These include the Foundation Recipes (the stocks and bone broths fit this category), as well as the Oatmeal Deluxe Breakfast Bars and the Coconut Muffins. (Also, at the end of the Pumpkin Pie Bread recipe, we strongly recommend the Pumpkin Pie Bread muffins. They’re a must.) Many of the Turkish and Moroccan choices are regular go-to recipes for us. And there are others that we return to seasonally and on holidays, such as the Turkey with Cranberry Glaze on Thanksgiving and Christmas. The Portobello Muschrooms Stuffed with Chestnuts, Apples, and Wild Rice is also really fun around Christmas time. And the Miniature Lacy Potato Latkes are a Chanukah standby. We love the Mediterranean Caulifower Kale Roast with Feta throughout the winter. The Fudgy Nibby Brownies from the Winter chapter are also a perennial favorite. There is a picture in the book of a Fudgy Nibby Brownie tower that we made for a wedding in lieu of a cake, but they’re great for any party or just to have on hand as snacks, provided you don’t eat the whole tray at once. 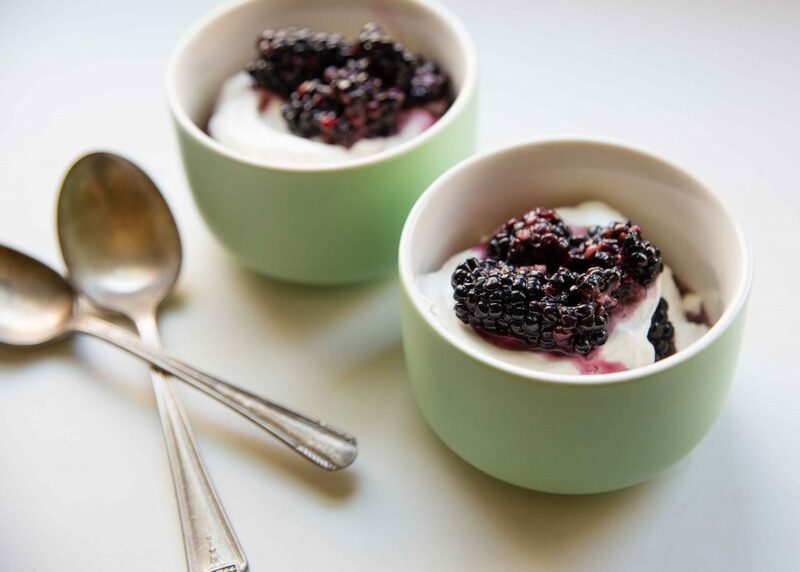 As we mentioned, we experienced a big thrill when we saw how the literature and recipes were coming together, starting with a first autumn recipe that pairs Galway Kinnell’s scrumptious “Blackberry Eating” and a poem by Mary Oliver with a luscious “Blackberry Parfait.” This dish is both sophisticated and perfectly appropriate for a beginner cook. The close reading that goes with it also good for a first-time reader of poetry since the essays are designed to make the poetry more accessible. In a more sophisticated vein, we’re really excited about the Middle Eastern Feast in this book, which is spiced with the poetry of Rumi and Hafiz. TFP: Did you listen to any particular music or albums to get you into the right head space to write the poems / craft the recipes? MK/SM: For inspiration, we rely more on comedy than music. During a radio show, an interviewer once asked us what piece of music would make the proper accompaniment for our book. We didn’t know what to make of that question, but we referred her to page 266, where we discuss a cantata to coffee by Johann Sebastian Bach, along with a dithythramb to chocolate. We can’t quite say that pieces like these inspired the recipes or the writing. But when we thought the whole project was finally finished, we sang our take on the Jeff Buckley version of Leonard Cohen’s “Hallelujah” for days. TFP: What did you not expect from Muse that surprised you? MK/SM: Well, our respect for each other’s skill sets went up. You learn knew things about each other when you’re in the trenches together. We had a really good working relationship, in short, and we ended up with new respect for each other’s complementary abilities, work ethic, and grace under fire. We simply could not have written this book without each other. TFP: Who are some of the food poets that inspire your writing? MK/SM: This large-format 500-page book begins by presenting an historical perspective on the link between literature—especially poetry—and food. The book draws on material from many traditions and eras: from the ancient Greeks and Romans to the Bible, from the medieval Sufis to the Japanese, from the great Romantics and Transcendentalists to a dazzling pageant of modern poets. Authors represented include Homer, Lu Tong, Rumi, Chaucer, Basho, Milton, Keats, Dickinson, Hopkins, Lawrence, McKay, Neruda, Machado, Stevens, Hurston, Plath, Tom Robbins, Derek Walcott, Mary Oliver, Wendell Berry, Lucille Clifton, Michael Ondaatje, Billy Collins, Linda Hogan, Elizabeth Alexander, Jorie Graham, Li-Young Lee, Jane Hirshfield, and a great many others. TFP: Do you anticipate another collaborative project in your future? MK/SM: Sure. But give us some time to recover on the island of Maui first. We have to find the right inspirational trigger. And the Hawaiian state triggerfish—called humuhumunukunukuapua’a, or humuhumu for short—is something we’d like to see! What a wonderful experience meeting both of you on Maui, Myra and Stephen. 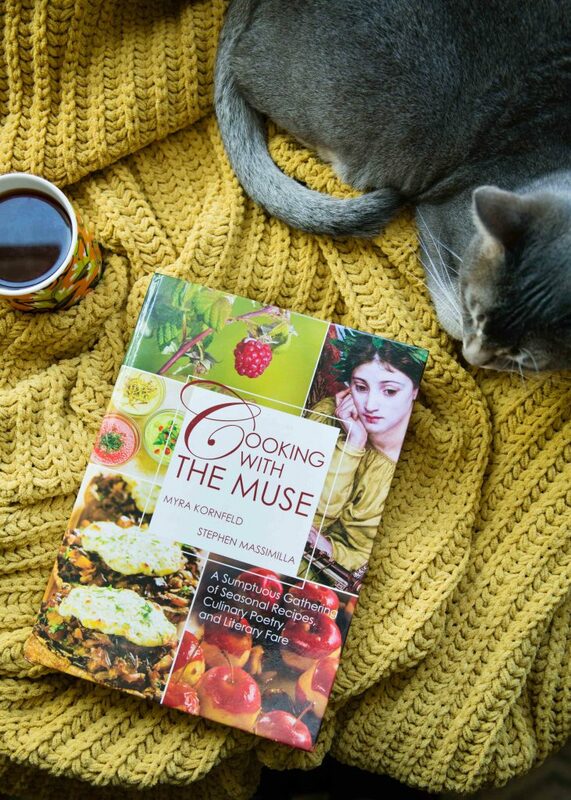 Can’t wait to read Cooking with the Muse! It’s a delightful book. Enjoy cooking from it, Marilyn. Myra and Stephen are both very creative and their collaboration in Cooking with the Muse is commendable.